If you have constructed the WATERSKIN1_1 pickup from the tutorial on Timed Events using the Organiser= Script Command you will have noticed that it needs improvement. Lara performs the animation as soon as she steps on the trigger sector. This means the pickup animation is performed at the edge of the sector and not at the centre where the WATERSKIN1_1 object is located. You could delay the pickup animation by changing the time in the Organizer but choosing what time to change it to may be tricky. Lara would reach the centre of the sector at different times if she was running or walking for instance. A better solution is to use a fragmented trigger. With a fragmented trigger you can divide the trigger sector into smaller parts and control which parts will do the triggering. The various ways you can divide the sector and nominate the active parts are explained in the NG Triggers tutorial in the NGLE manual. Note in Paolone's NG Triggers tutorial the pictures of the grids are the sector as viewed in the 2D grid panel of NGLE, so the top of the picture is North. The easiest grid to use when you want a trigger sector to be active only in the centre is the 3 x 3 grid and the centre area is designated square fragment (2,2). This is the trigger sector in the WATERSKIN1_1 pickup level that enables the Organizer. Fragmented triggers are a CONDITION type trigger so I will not be able to place it on the sector with the PAD type trigger since you cannot overlap special triggers. The different timer and OCB buttons for the triggers may also not allow overlapping. I make the FLIPEFFECT trigger a TRIGGER type and remove the One Shot. I create the fragmented trigger with One Shot enabled and make it a PAD-like trigger using the (E)xtra option. No changes to the script are made. Now Lara will only pickup the WATERSKIN1_1 when she steps on the centre of the sector. 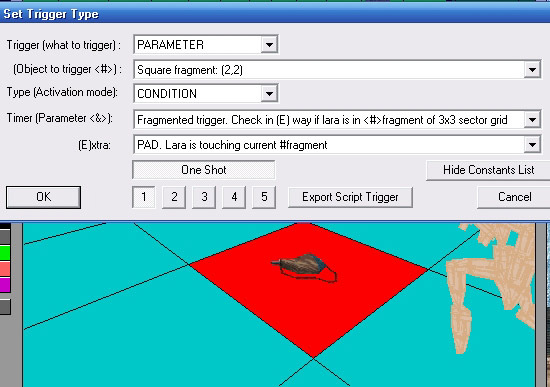 See Paolone's Miscellaneous sample project for another example of a fragmented trigger. When Lara steps on the centre of the trigger sector she performs her pickup animation and the WATERSKIN1_1 object disappears at the correct point of her animation and is added to her inventory. However, if Lara performs her pickup animation as she rolls onto the trigger this looks strange. She also performs the pickup animation if she is holding her pistols and this looks cool but I don't want this either so I need to add further restrictions (conditions) on when the FLIPEFFECT trigger can activate. I need more CONDITION triggers. See this tutorial.